Amazing Bonsai will be on display. Bonsai of various sizes and species as well as other bonsai-related items will be for sale by club members at attractive prices. Open to the public and admission is free. ​Please join us for an exciting time. Bonsai, pots, and supplies will be available, come early for the best selection. See photos of the prior show here. Balboa Park operates a free tram service that goes from the old Naval Hospital ("Inspiration Point"), which has lots of parking, at Park Blvd & Presidents Way to the center of the park in front of the Mingei Museum. 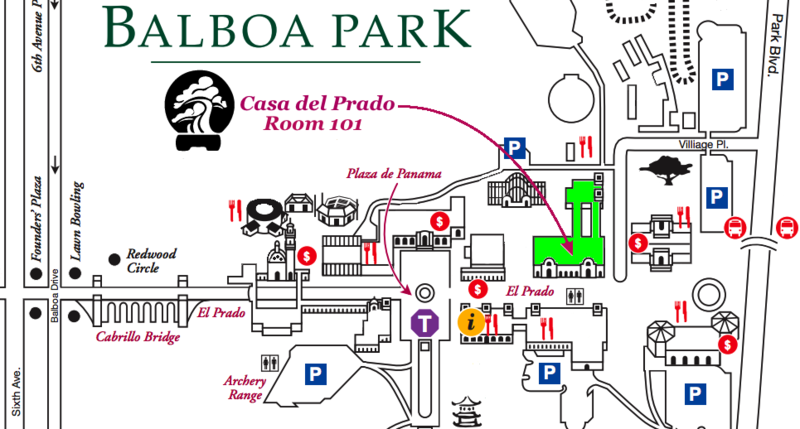 From there, it is an easy walk east down El Prado to Casa del Prado. The trams are bright green and usually arrive every 15 minutes. ​Members are reminded they do not have to wait until Friday evening to fill out their consignment sheet for the bonsai sale. You can download, print, and fill it out in advance. This will expedite the check-in process. Instructions are included with the sheet.